While I’ve already posted two extensive reviews on AA 787-9 Premium Economy on the 787-9 between Dallas and Madrid and reverse, both trip reports were on the inaugural weekend of the product. 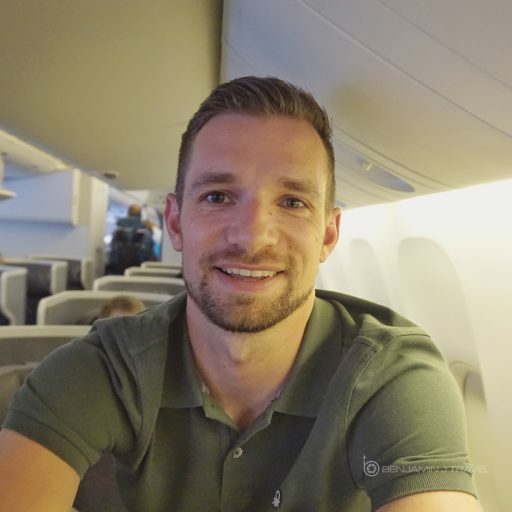 I found myself in the same cabin about 2 months after the launch of AA’s international Premium Economy product and though I’d provide a min-update on the service. 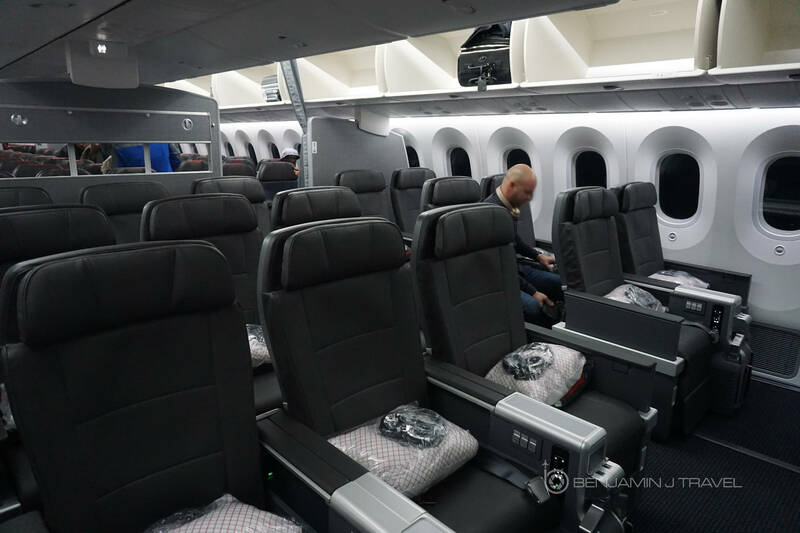 We were ultimately bound for Brussels but our first segment was in AA Premium Economy on the 787-9. The 787-9 is already one of my favorite aircraft in the AA fleet. After spending a good hour noshing at the DFW Amex Centurion Lounge, we headed for Gate D30 which is halfway down Terminal D from the Centurion Lounge. Last time I was flying to Madrid, our departure was out of Terminal A which is less than ideal due to the smaller gate area. Terminal D is the “usual” departure terminal for AA’s international and wide body flights. 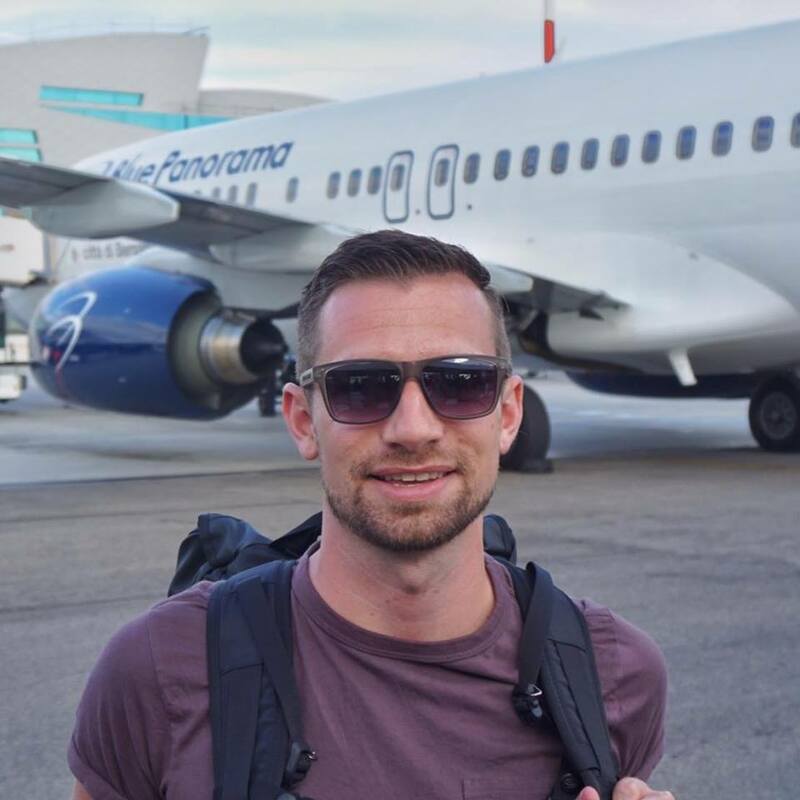 We headed to the boarding gate about 10 minutes before departure but boarding Business Class had already boarded and they were calling OneWorld Emerald and Sapphire so we swiftly boarded right as we approached the gate. I really don’t like when flights board earlier than scheduled as it sets up potential issues with overhead bin space if you miss half the boarding groups. 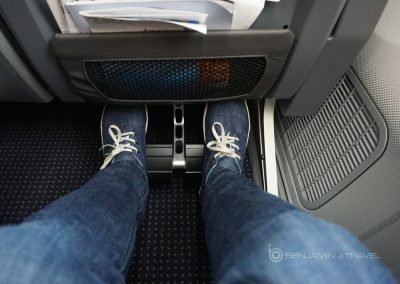 We took our seats in 10J and 10L, the window pair in the second row of Premium Economy which is my second favorite pair of seats in Premium Economy. 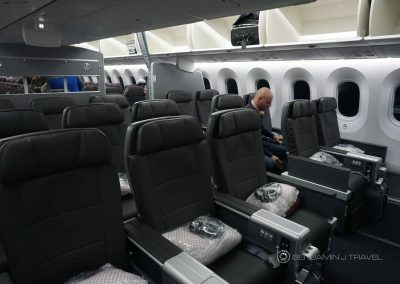 My favorite would be the bulkhead row seats 9J and 9L. I prefer the right hand side of the aircraft as the larger handicap-accessible lavatory is on this aisle. 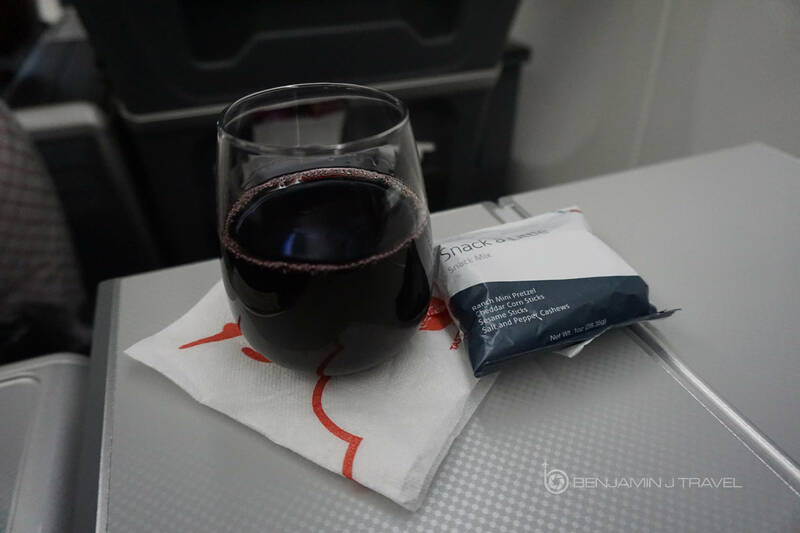 The Premium Economy “amenity package” was on our seats but one noticeable item was missing the red amenity kits that was included on my prior flights. These included an eye mask, lotion, and ear plugs. 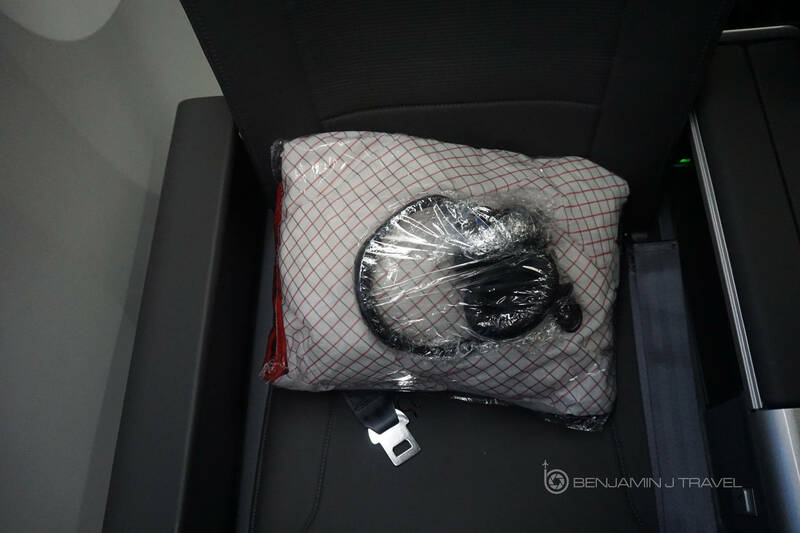 As before however, there was a pillow, blanket, and large premium headphones in the bundle. Boarding took a bit longer than expected but we still pushed back from the gate close to on time. 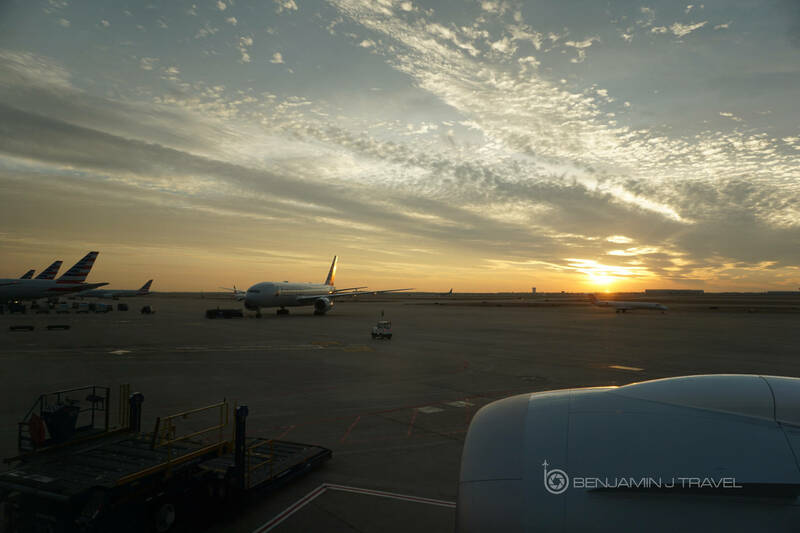 With a departure just before 6 PM, there were some beautiful tarmac views right out my window with the sun setting over DFW. We had a quick, smooth climb out of DFW and headed for our cruising altitude. American’s 787-9 is equipped with in-flight WiFi but it took a bit of time before the WiFi to link up on this flight. But once logged on about 30 minutes into the flight, the WiFi speed and consistency was decent throughout the flight. On my prior flights in international Premium Economy on AA, the crew was sure which lavatory Premium Economy passengers were supposed to use. But on this flight, that question seemed to be squared away. 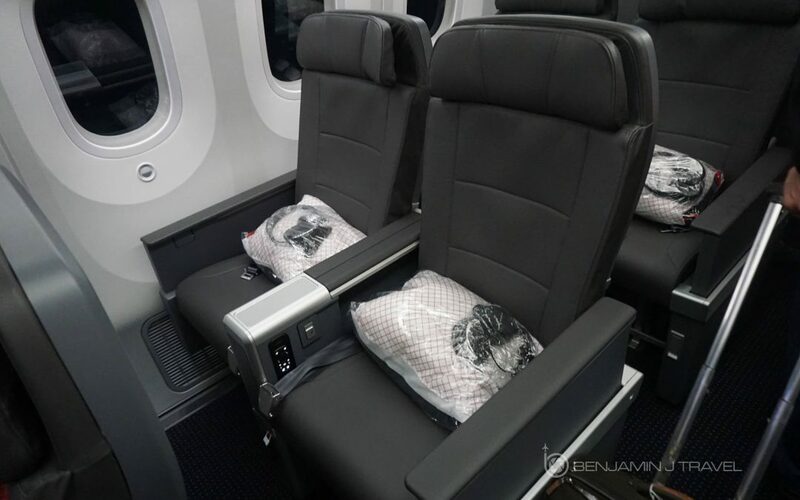 The curtain was closed between Economy and Premium Economy and passengers in Premium Economy were told to use the Business Class lavatories. 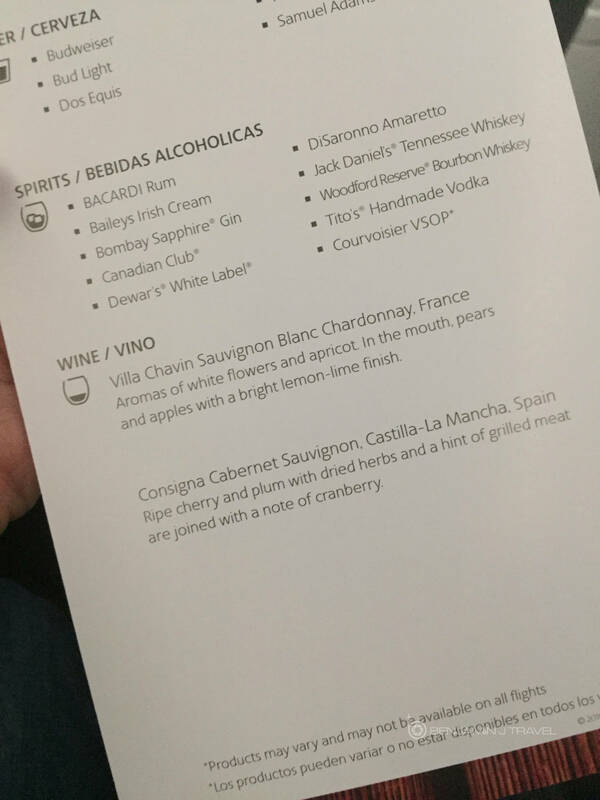 About 30 minutes into the flight, drink service was started and beverages were offered in glasses as opposed to plastic cups. Pretzels were also handed out with drinks. 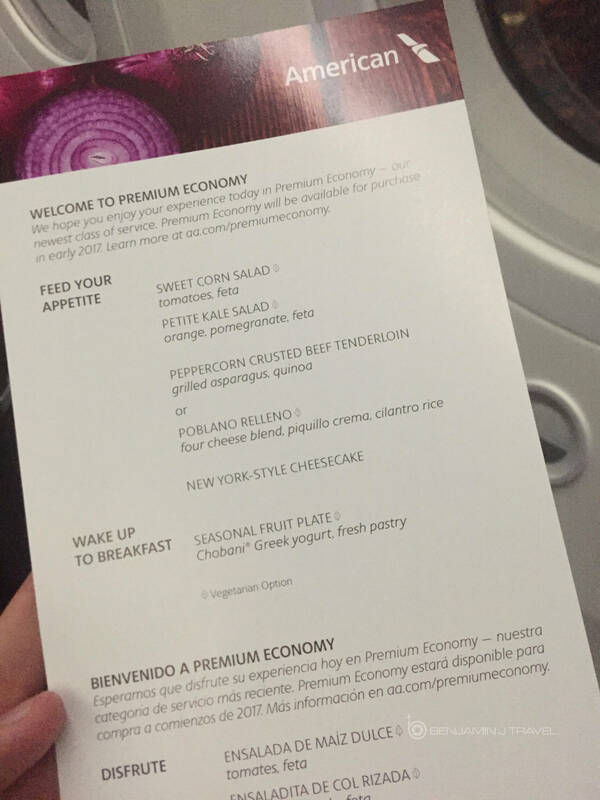 Paper menus were also distributed along with beverage service. 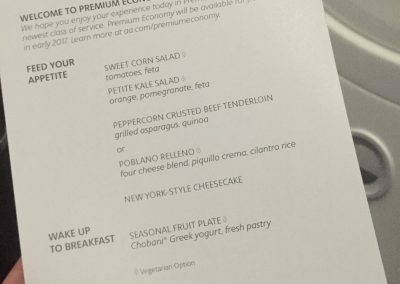 For entree options, there was a choice of Beef Tenderloin or Poblano Relleno, the latter being the vegetarian option. I opted for the Beef Tenderloin as the poblano didn’t sound great. The crew for dinner service was energetic and friendly. 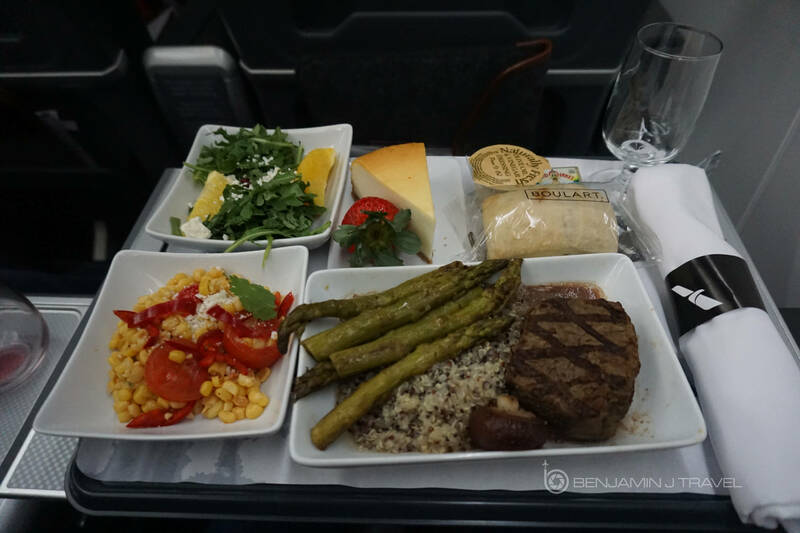 Beef dishes are often overcooked in-flight and unfortunately that was the case with this beef dish. The meal overall was OK but not great. 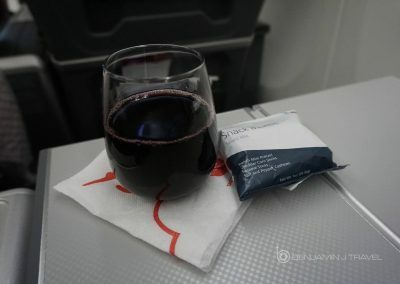 Compared to previous Premium Economy flights, the crew used glassware consistently on this flight and was more attentive with drink refills than before. Dinner trays were collected quite quickly and I got tired fairly quickly and was ready to doze off not too long after dinner service. 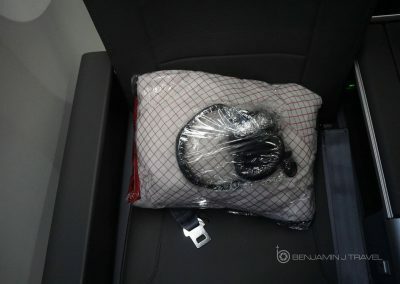 The Premium Economy seat isn’t bad for catching sleep for non-lie-flat. I ended up getting over 3 hours of sleep on the flight and waking up not long before breakfast service. Breakfast service was served about 90 minutes out of Madrid and it was the exact same breakfast as my previous Dallas to Madrid flight: Chobani yogurt, warmed roll, and fruit. The crew was fairly rushed for breakfast and the service wasn’t as friendly as during dinner. Apparently the friendly service during dinner was a fluke for this crew. We had a smooth landing in Madrid and touched down a very cool but sunny day. We arrived close to our scheduled arrival time and quickly deplaned into Terminal 4S. 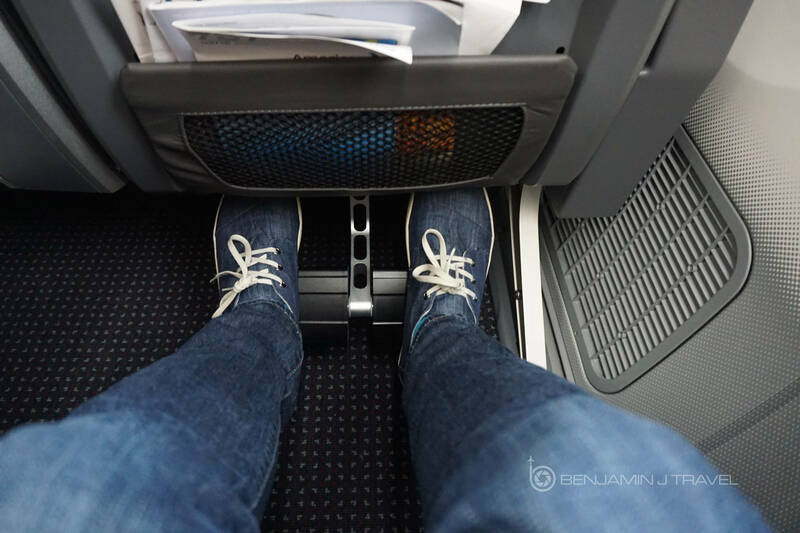 As a look back, this was a fairly unremarkable Premium Economy flight with American Airlines. The service was really mixed depending on who you interacted it with. 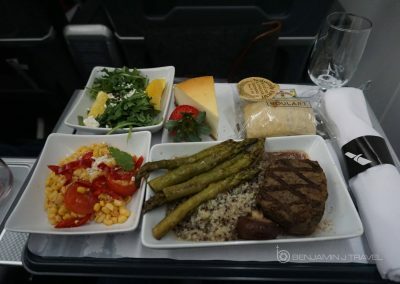 However, I will give American Airlines credit that they seemed to have smooth out some of the kinks in Premium Economy service. 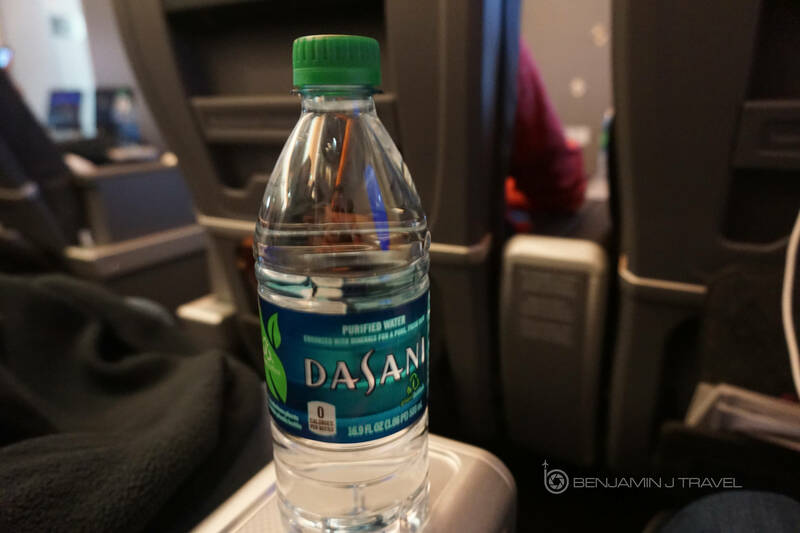 Even though the service was so-so, they seemed to have figured out things like consistent glassware and which lavatories to use in the Premium Economy cabin. 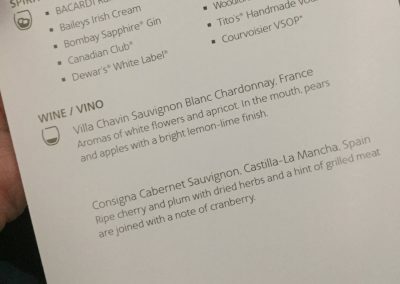 These were things the crew seemed unsure about on my previous Premium Economy flights. I’m still a fan of the new Premium Economy product from AA and outside Business or First, AA 787-9 Premium Economy is a very comfortable way to cross the Atlantic.